How Vibrant is the Hardware Startup World? It would seem hardware startups are booming. First, the amazing success of the GoPro business and IPO, which set a 23-year high-water mark for a consumer hardware company. Second, there seems to be a growing number of hardware startups bubbling in incubators like Lemnos Labs and Highway1. Third, Kickstarter and other crowdfunding sites have enabled hardware startups to mitigate one of the biggest risks in starting out: obtaining a reliable proxy for consumer demand. But do the data support the idea that the hardware ecosystem is as vibrant as it seems? 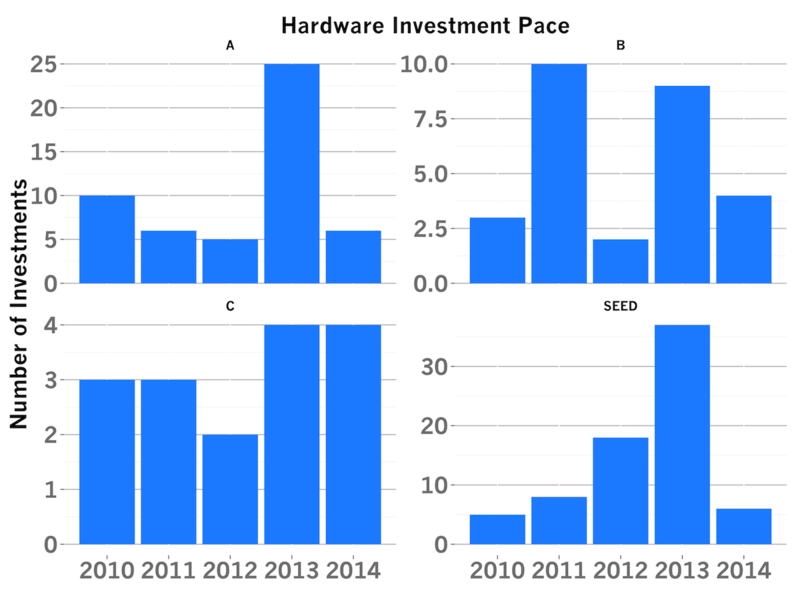 The chart above shows the sizes and frequency of hardware investment in the US since 2010 across different investment stages (Series A, B, C and Seed), using Crunchbase data. Each investment is a red circle. Each plot also shows a linear trend line for round sizes in gray. The most salient data point from the chart is the sudden increase in the sizes of hardware seed rounds in the past 24 month or so. Before 2013, there were very few hardware seed rounds exceeding $1M, but in 2013, 56% of seed stage hardware companies that raised rounds, raised more than $1M. Other segments of the market, namely Series A, B and C, have kept their typical investment size relatively constant. The bar chart above shows the investment pace by year by Series. Note, the 2014 data is through May. Series As and Series Seed volumes spiked dramatically in 2013, more than doubling the previous years’ investment counts. Series C is relatively constant and Series B varies a bit, but I suspect mostly because the volumes are relatively small. Only about 5 hardware companies raise Series Bs each year, according to this data set. I wonder how the 2014 market will evolve. On one hand, the seed volumes this year are much smaller than I expected, but that may be due to companies operating in stealth, rather than an actual decline in investment activity. I’ll have to wait for the Crunchbase data to fill in before drawing a conclusion. Overall, though, there’s no question hardware startups have witnessed a recent surge particularly in the seed market both in number of seeds raised and the average sizes of those seeds. In 2013, these hardware startups raised nearly twice as many Series As as the preceding few years, a strong positive signal. Hardware is in vogue and hardware startups are attracting the capital they need to grow, in greater and greater numbers.